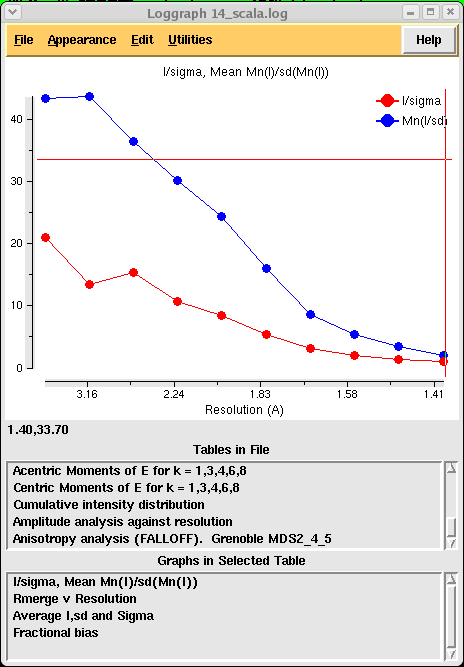 matthews_coef calculates the number of asymmetric units in your unit cell. sortmtz sorts the reflections, and can be used to combine different mtz files. scala scales all the equivalent reflections together and generates statistics indicating the quality of your data. truncate converts any negative intensities to positive and then converts them into mean amplitudes putting them on an approximate absolute scale using a Wilson plot. freerflag flags a fraction of your reflections for use as your "R free" set during later refinement. 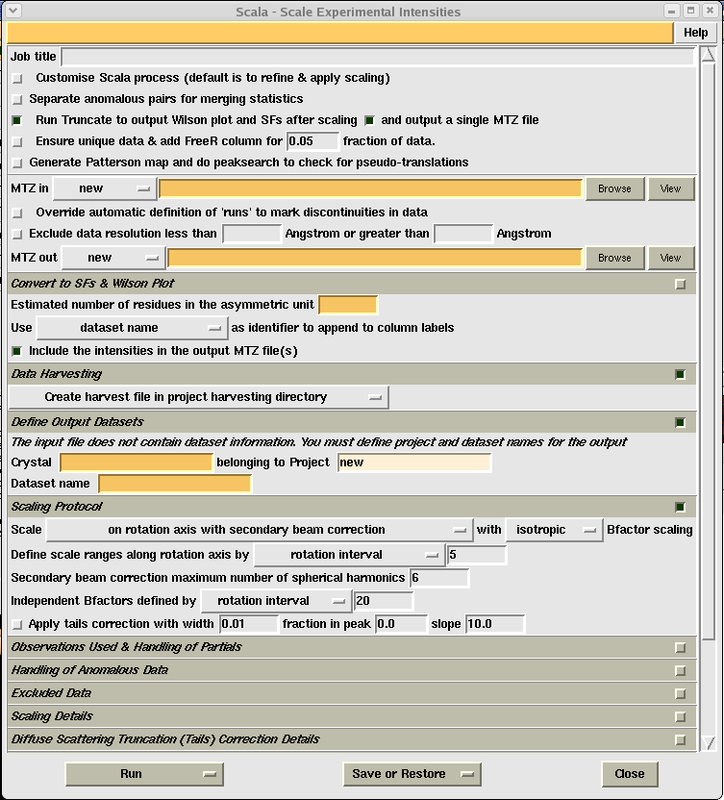 You will need to set up a new project which you can do by clicking on the "Directories&ProjectDir" button on the top right, and then on the next screen click "Add project" (on the right), type in a short reference name in the box next to the word "Project" and then give it the directory path of your new ccp4 directory created above (something like /home/simon/myprotein/ccp4/). IMPORTANT: you then need to select your new project by clicking on the tab in the middle of the screen next to the words "Project for this session of CCP4Interface" and selecting the name of your new project. Once you've done this click on "Apply&Exit" on the bottom left of the screen. You need to calculate the number of asymmetric units in your unit cell for use later on in scaling. You can do this by calculating the solvent content. On average protein crystals should have a solvent content of around 43%, which equates to a Matthews coefficient of between 1.7 and 3.5 cubic A/Da. To interpret your results you need to look down the "%solvent" column and choose the line with a solvent content closest to 43%. In the above example this equates to 2 molecules per asymmetric unit (i.e. in this case two 14,000Da monomers in the asymmetric unit). Write down this value and then click the "Close" button. In general the orange boxes are the ones you HAVE to fill in, the little green squares show a selected option, and the little grey squares an unselected option. 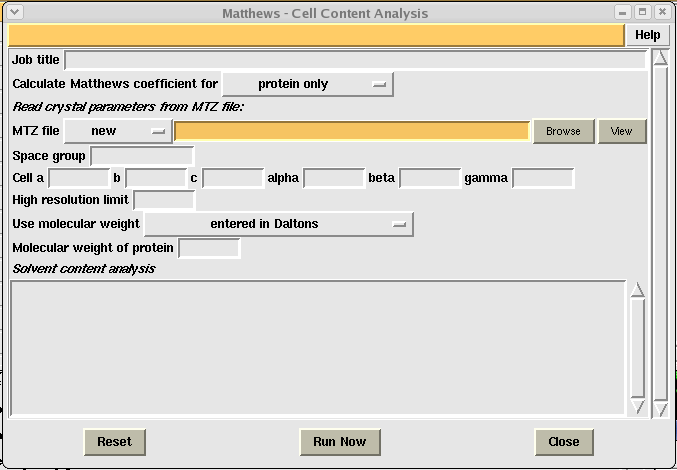 You can access extra option by clicking on the little squares on the right of the different menu options, however all the options necessary for running the program should be visible straight away. Click on the grey box to the left of the words "Ensure unique data & add FreeR column for 0.05 fraction of data" (this is normally OK although if you have very high or low resolution data you might want to fiddle with this to ensure you pick about 2000 reflections for your free R set). Using the "Browse" button select your mosflm.mtz file in the "MTZ in" box. Type in what you would like your output file to be called in the "MTZ out" box (I suggest mosflm_scala.mtz). If you like you can limit the resolution range by selecting the line above this box and manually setting your resolution limits. 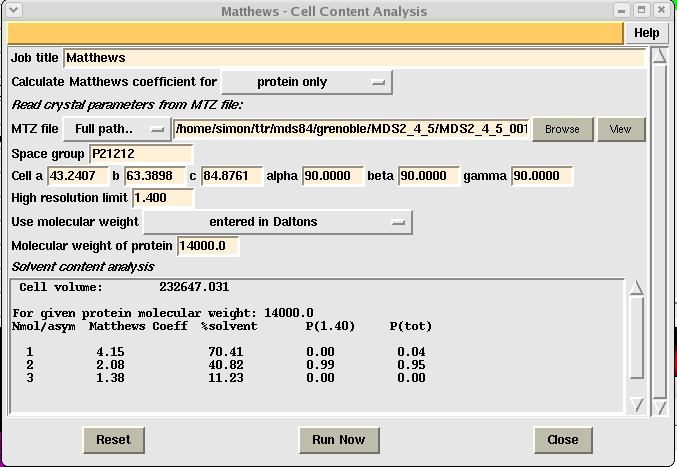 In the "Estimated number of molecules in the asymmetric unit box" enter the number you calculated in Matthews_coef. You can enter an arbitrary reference in the "Crystal" box (i.e. Crystal1) and similarly in the "Dataset" box (i.e. Dataset1). Although not particularly informative in this case, this is the box that displays all the commands necessary to run CCP4 programs. It is normally well worth being aware of these commands whenever you run anything in CCP4i as when things go wrong, this is normally where you can change them. Click "Continue" to run the job. Once the job is running you can close the scaling input window (click "Close") and you should now see your job listed as "Running" in the main CCP4i window. This may take between five and ten minutes, again depending on the speed of your computer and how big your dataset is. Ideally you will want your overall "Rmerge" to be below 0.2, and your "Mean((I)/sd(I))" to be 2 for the outer shell, and over 10 overall. You also should have a "Completeness" of over 90% overall, and a multiplicity generally higher than 2. If your Mean((I)/sd(I)) is below 2 in your outer shell you will need to reduce the resolution of your data. If it is around 2 I personally would leave it, however, some people might question the wisdom of this if you have a very high Rmerge (in this case 0.759). My counter-argument would be that there are still 6035 recorded spots with over 90% completeness in this shell and a relatively high multiplicity of 5.1. Thus I think you would be throwing out quite a lot of good data if you reduced the resolution. In this table you want to check to see if the quality of your data drops off suddenly as the resolution increases. You can follow this by looking at the "Mn(I/sd)" column and also the "Rmrg" column. With this data you can see the Rmrg doubles between 1.57 and 1.48A, which for some people might be good cause to cut the data at 1.57A. This table shows number of reflections, completeness and multiplicity (amongst a couple other things) across the different resolution shells. Again you want to look to see if your data drops off significantly at higher resolutions. In this example there is a drop between 1.48 and 1.4A, however the overall values for completeness (%poss), multiplicity (Mlplct) and Rmeas all look OK to me. This essentially shows a tail off in spot intensity as resolution increases. You just need to make sure you have a roughly linear relationship at higher resolution as above (don't worry about the bump in the lower resolution data, this is to do with a bias in how the scaling is performed). You are of course free to read up on what all this means on the CCP4 website! 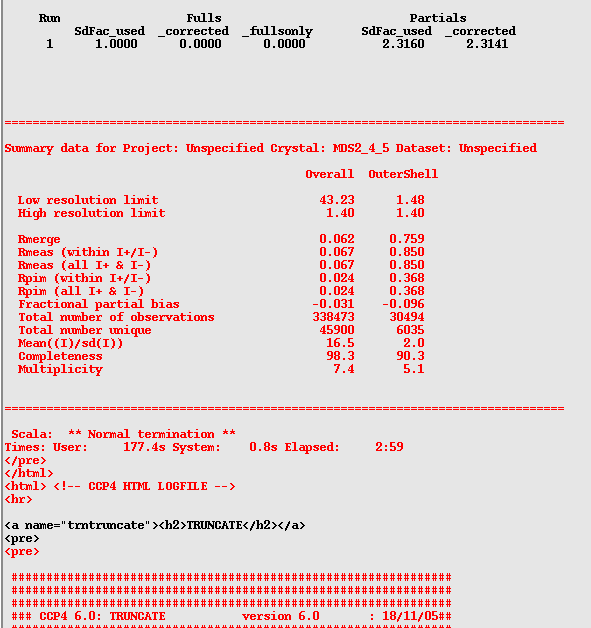 Assuming you are satisfied with the quality of your data, you will now have a scaled and merged dataset called mosflm_scala.mtz which you can look at using mtzdump (mtzdump hklin mosflm_scala.mtz). 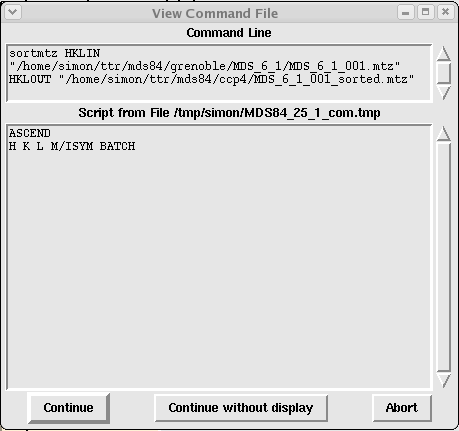 This time, instead of a list of batches you will have a list of reflections, and the file itself should be about ten time smaller than the mtz file that came out of Mosflm (in the above example, 3Mb rather than 80Mb). If you need to go back and reduce your resolution you can do this by highlighting your earlier scaling job in the CCP4i GUI and then clicking on "ReRun Job". If your statistics are substantially worse than I have described above you probably have a space-group problem. In this case I would go back to Mosflm and play around with the autoindexing a little more. If your scala job fails with the warning: **** ERROR: damping has failed to prevent negative scale factors **** the scales are varying so much across your images that some of them are coming out negative. 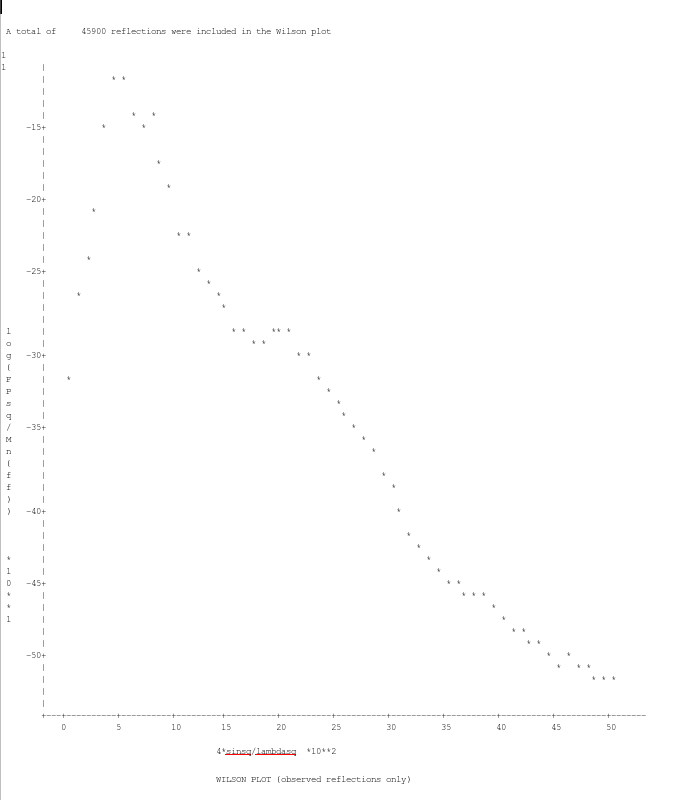 Try adding a damping of say 0.1 to the scale factors e.g.